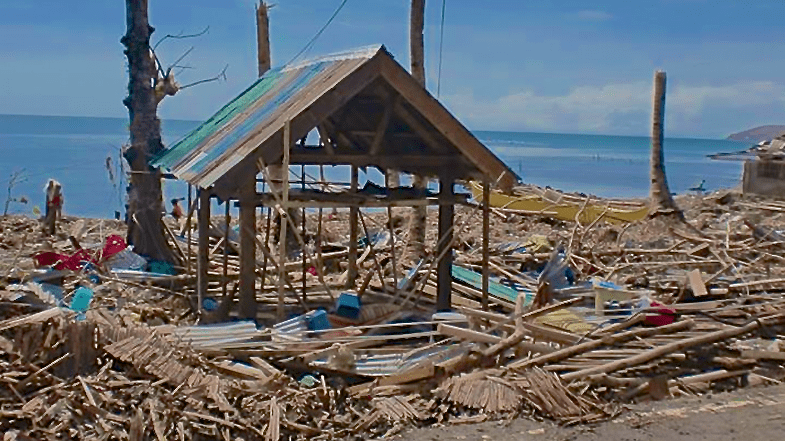 Forever going forward, the history of Guinob-an and Samar will be divided into before Yolanda, and after Yolanda. Before Yolanda, our island was, as I have described it to you, a place of beauty and simplicity where nature was always present; whether in the sparkling, teeming waters of the Leyte Gulf, or in the breeze whispering through the coconut trees, or in the forested hillsides sweeping up from the water’s edge. In Los Angeles, I waited for three days with no word from my family. Then on Sunday night, November 11, my phone rang. It was Rommel, my brother. He had gotten an old motorcycle to work, and had spent ten hours getting to Catbalogan, normally a five hour drive, where there was cell phone signal. The news was this. All seven of my brothers and sisters lost their homes but no one was killed. The only home left standing was my mother and father’s, the sturdy two-story cemento na balay. The second story and roof didn’t survive but the first floor stood. I gave thanks that they were all alive, and then made arrangements to send money to Manila where a nephew, JR, would get two sacks of rice and asthma medicine for my mom, blood pressure medicine for my dad, and insulin for Rommel. Getting it to Guinob-an would be difficult; the roads were out, and desperate gangs were robbing people. Rommel told me that he had traveled with a convoy, armed, and would do the same when the rice and medicine arrived in Catbalogan from Manila with JR. Then he left and went back to Guinob-an. Pictures began to appear on the news and social media, and what I saw just made my heart sink. Everything was gone—the coconut trees, the mango trees, most of the homes. It wasn’t just a matter of rebuilding the houses. The beautiful, tropical carpet of trees and vegetation that had been the deep identity of Samar had been peeled off; the island had been flayed by the typhoon. Now the land was bald and brown and unrecognizable. It was as if God taken a razor and shaved the earth’s surface of everything that made our town, and our island what it was. It breaks my heart to describe Guinob-an like this here, where I have labored to share an image of timeless beauty but the story is not complete without it, and the greater, more important thing for me to do is to shout from the hilltops as loudly as I can that we have been truly devastated, and it will take many years before we can even contemplate a return to normal life. In the days and weeks that followed the storm, Filipinos from around the world came together to try to help Samar, Visayas, and the Philippines recover—and Michael and I have been part of that effort, and will continue to be part of it for as long as is necessary. We were able to get a three-day supply of rice for all the families in Guinob-an very early, before the relief agencies were there. We are now working to replace all 28 boats that were lost, to get seeds for planting, and to help replace the coconut trees. We’ve been able to do these things because of the generosity of others, Filipinos and friends of the Philippines. Michael showed me an article that says that in Indonesia, as of December 26, 2013, on the 9th anniversary of the 2004 Tsunami, tens of thousands of people still do not have permanent homes. Is that what awaits Guinob-an and the rest of Samar? We Filipinos will not let that happen. I wish Michael and I could help everyone but at least we have been able to help family, and our town. It’s not enough; it will never be enough; but we will do all we can. And other “Daughters of Samar” and “Sons of Samar” living abroad are doing the same thing, helping their towns. We meet them everyday online and seeing what is happening, I’m more and more confident that Filipinos everywhere are not going to rest until we make things right. I still have the dream of living in Samar again; even more so now. So much has been destroyed, but in an odd way, all of this has made me feel closer to home. Every day we learn what the developments are, what the challenges are, and we see evidence progress—and love, and caring for one another—and I know that even if it has been stripped bare of all the things that were there in my childhood, the same heart still beats beneath the surface. I dream of trees but we will have to plant them. I dream of boats but we will have to build them. But with the true spirit of helping each other—what we call bayanihan—I am sure that peace and beauty will return, and when it does, we will be there. In the early days after the storm, when we first were able to reach my relatives by phone, while everyone was still in shock and mourning over what had been lost, my niece Rochelle, had already gotten past that. She said: “We’ve been given a second life.” Then she said: Patuloy ang buhay,” which means: “Life continues.” Or get on with living again. Samar has a second life now. I will close with a picture of me having fun with my nieces and nephews the last time I was home. It is for them that we must overcome this. It is for them that I wrote this, and for them that I will work, like so many other sons and daughters of Samar, to make things right once again, and to make this second life a beautiful one. It’s our chance for a second life.